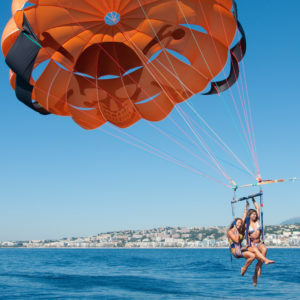 Alone or not, with family or friends, parasailing in Nice is bound to give you a thrill! All of our activities allow you to enjoy the fresh air and sun with something exciting but friendly, so why not try some! 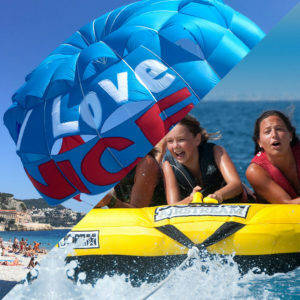 With us you can enjoy an adventure in the air and at sea, having fun and exercise while exploring something new! Looked after by a team of professionals who will apply all the safety rules you can really enjoy climbing more than 30 metres into the air. Your instructor will take you across the bay as far as old Nice. From up in the sky you will be able to see where you are staying from a new, fun perspective. You don’t need any equipment, we’ll take care of you and provide everything you need for a fun and relaxing time that is sure to amaze you. You’ll never look at Nice in the same way again. Are you looking for thrills and extreme sports? 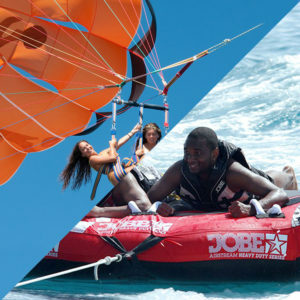 Why not chose our parasailing + tubing combo? Hold on tight behind a boat for a wild tubing experience across the water in front of the luxurious Promenade des Anglais. Excitement and unforgettable souvenirs guaranteed! Just like with parasailing, several of you can get on the same tube to enjoy the thrills. And to make the experience even better we have a large range of different tubes available. But, because at Nikaia Watersport your satisfaction is what drives us, you can also choose a calm and leisurely trip if you prefer. It’s up to you. 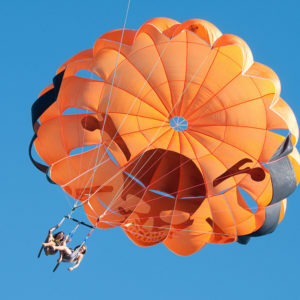 Parasailing is perfect for celebrating a birthday, a bachelor party, a promotion, a move…. But deep down, there is no ideal opportunity to take off. The few minutes of pure happiness to enjoy alone or with your loved ones will allow you to relax and live the moment to the fullest. 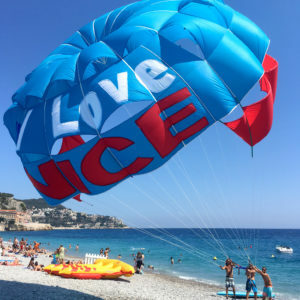 Whether you are in Nice for holiday or your home town, you will certainly find it a pleasure to experience this extreme sport accessible to everyone. In any case, you don’t have to wait until the holidays to enjoy a session with us. Indeed, parasailing flight plans a 2km loop in the Baie des Anges. Does that seem short to you? Don’t worry, it’s more than enough to soak up sensations as strong as they are beautiful. What is also great is that you enjoy both an outing over the Mediterranean and over Nice. Are you afraid of being suspended in a void? Don’t worry, we take great care to ensure your safety and all the equipment we use is regularly checked. Nikaia Watersport technicians also provide you with all the necessary advice before the session. Then go for it! 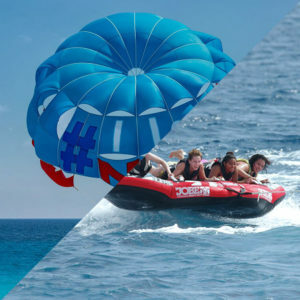 Nikaia Watersport: a multitude of water activities! Do you want to do something different? We’ve got what you need! Perhaps you’ve seen, either live or on a video, those strange jets that push you above the water, allowing you to perform lots of different tricks? 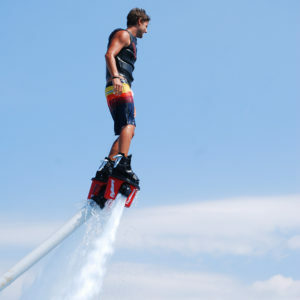 This unusual and original activity is called flyboarding. Invented by a Frenchman fairly recently, in 2011, it has quickly conquered the world. 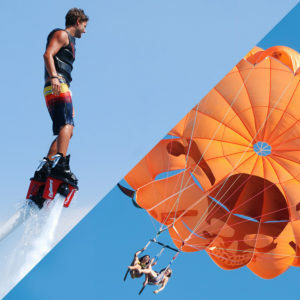 You can try it with us if you choose our parasailing + flyboarding activity combo. Connected to a jet ski you can experience the pleasure of flying while trying the possibilities offered you by this astonishing new sport. 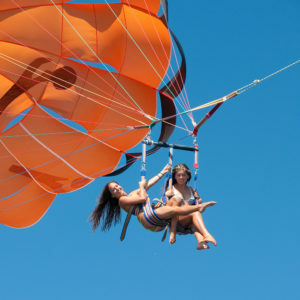 You too can enjoy doing your own thing in the air and the thrills of the incredible plunges! So now you understand, we are offering you our professional expertise and water sports in an outstanding setting. So don’t hesitate, we’ll make your experience one of the best parts of your summer. If you are an early bird you can enjoy a 15 euro discount by coming along to enjoy the freshness and light of the morning. You can even give your friends a gift voucher for an extra-special present! 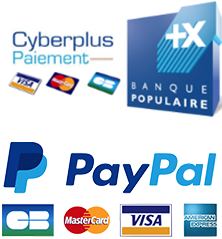 Reserve on our site online or come and see us in Nice. We’re opposite Cours Saleya and looking forward to seeing you.